This is a MALE alimango or mud crab. You can tell by the shape of its “apron” or flap on the underbelly. In males, the shape is quite phallic, and pointed. 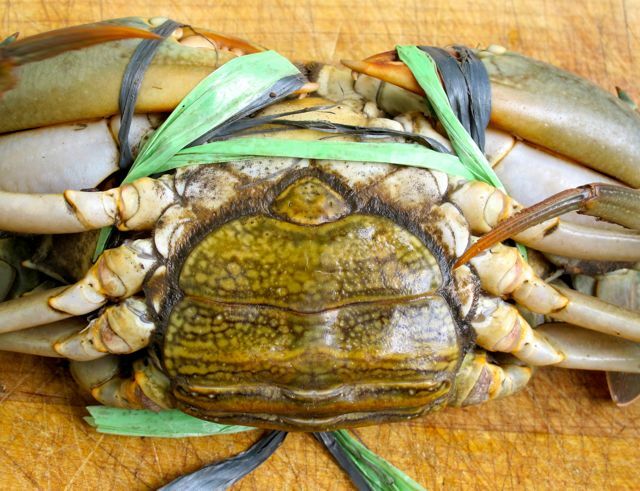 It is less “obvious” in alimango, but if you go to this site, you will see that it definitely looks more male-like in blue crabs or alimasag. That is also one of two sites I used as reference material for this post. In juvenile or young males, the flap is tightly shut and you would difficulty prying it open. That means he probably hasn’t reached sexual maturity and hasn’t been able to get physically randy, yet. 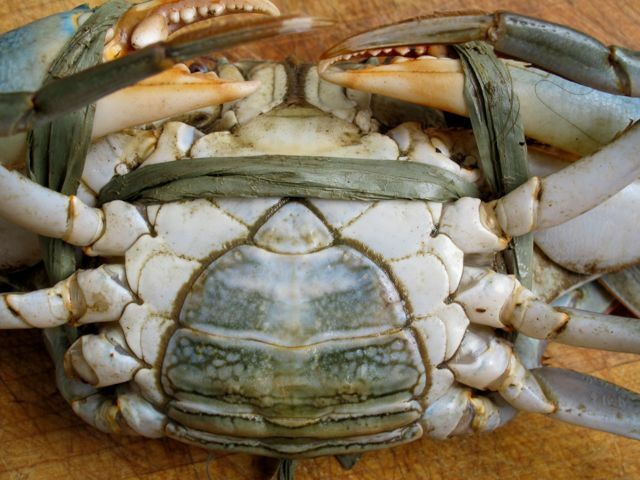 Here is a second site with comparisons of sexual markings for mud crabs. And finally a third reference, here. This crab is a FEMALE. Actually, it is a MATURE female, and note the roundness of its flap, and the color of the shell, compared to the JUVENILE FEMALE VIRGIN. You can readily open the flap of this live crab, which appears a little “hairy” around the edges, and this is a sign that it is capable of mating. However, not all mature female crabs have necessarily been mating. And here is a really interesting factoid from the reference sites, the mature females mate when they molt (or lose their shell) and a protective male covers the soft-shelled female, he flips her over so they are belly to belly, his manhood comes out and deposits sperm in her storage “cabinets” and then flips the female over and covers and protects her for several more days until her shell goes hard. Then the female walks around with a bunch of sperm in her and uses the sperm to fertilize her eggs many weeks or months later! She then has some 1+ million eggs and statistically only one or two of the little crab critters will make it to adulthood. So aha! Yes, it’s totally patently DUMB to eat either JUVENILE or ADULT FEMALE CRABS. Unless they are raised in fishponds, but even then, you could argue that the females should be allowed to propagate some more. In enlightened western countries, eating female crabs is banned, for very good reason. This is something we should explore as well. Timely as the province of Iloilo now move to regulate the consumption of blue crabs. Female crabs have never been for sale in Australia, hence it is unusual to find much aligue. 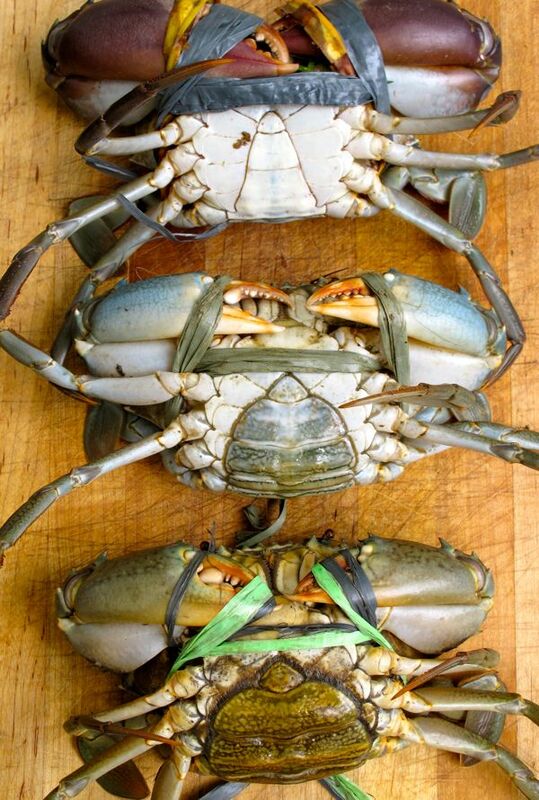 However the lagre Queensland mud crabs are meaty, tasty and succulent, that one is never disappointed. This is very informative, we love crabs and have always preferred the “virgin”‘ ones. Now I know how to properly call them. Can I ask how heavy these crabs were? A few weeks ago I bought both male and female crabs for a party. I wanted 1kg or higher for the male crabs, which I learned were called M1. Since I bought it just before the Chinese New Year, the prices for these were quite high at 950 per kg. 500g crabs sold for 400 per kg only, and the female crabs were priced at 900 per kilo regardless of weight. The Chinese New Year Is the peak demand for crabs, and the prices did surprise me. For comparison, I bought M1 crabs in November of 2010 and they cost 680 per kg while the females cost 450 per kg. These were all export quality and not only were the males full of meat, their carapace had a brown layer of fat as well. Gerry, these crabs were roughly 400g each, and the male and female crabs were PHP450 per kilo, while the female virgin teenager was PHP550 per kilo or so. Just yesterday, the range of crab prices can be huge in Metro Manila. From PHP450 at Seaside, to PHP770 at Salcedo market… absurd! MM, what is not to like about this lesson!! No illustration from books here, but wonderful photos of the real specimens in all stages of maturity. That is what I appreciate about your blog – much to learn from. Salamat gid. for alimango and alimasag, i usually get the male and “juvenile female” IF we’re just having them steamed (halabos). we’re after the meat and not so much for the halige. but when cooking with the halige, i go for the female. with burong talangka, i prefer live female baby crabs. i’m after the taba in the belly, and the black-malagkit taba under the talukap. yesterday, at the farmers’ market in cubao, it was (per kilo) P375-P350 for the alimasag. P550-P525 for the alimango. P80 for the tahong (mussels) and P50 for the talaba (oysters). live suaje na itim went for P550. no available talangka and ayungin. I always wanted to know what vendors meant when talking about ‘bakla’ crabs. Now I know,thanks MM. But lots of things are also dependent on climes and seasons and breeds. Here we have a species commonly called “tortue” or turtle because they resemble one with a big heavy shell and short stubby legs. They’re fantastic and meaty. 2 years ago one of my aunties was the first Filipina ever to be one of the Unesco “women in science” hence massive family reunion over here. You’d think nothing to do with crabs, except that the honoree auntie ‘s older sister, who was such a part of my upbringing, was revived from an unexpected heart attack by well a) the Paris emergency services b ) the excellent services and surgical teams of the Hopital European Georges Pompidou c) crab fresh from the Atlantic cooked multiculturally with ginger, spring onions, soy sauce, ginger, dried peppers from Espellette in the Basque country which we happened to have some from a previous trip, and Pineau de Charentes the local liquor. Sorry, long story, but auntie survived! Also, there seems to be some truth behind the fish-monger’s rule that crabs are at their best around the time of a full moon. Crabs are nocturnal hunters. As such, they hunt (and feed) more successfully when their underwater habitat is illuminated by the moon, and thus become heftier. Otherwise, they are practically left fasting on dark nights because they can’t see much. But I guess this only applies to crabs in the wild. I was able to see you last night. Thanks for the info. I’ll update my post about the baklang alimango. The comparison of the color taste and consistency of the ‘roe’ wiuld be helpful too! “Donselya” is the word we used for virgin. I don’t know if that’s slang or a colloquialism or whatever. Odit, in Visayan, doesn’t it refer to the opposite, meaning, no longer a virgin? if its a juvenile female, maybe “dalagita”, since “dalaga” would imply already capable of bearing offspring…prepubescent ?…a “tween” instead of a “teen”. Agree with Odit, it means virgin in Cebu. In NY you can buy female crabs from the Asian supermarkets. It’s the catching of female crabs here that is prohibited. i don’t know where these crabs came from, they’re available almost year round but a little irregular during the winter months. Largest ones are about $15 a dozen and less for smaller ones. I also believe they are fat and full of aligue during full moon or shortly before and only buy them at this time. MM I think it is taken from the Spanish word doncella which means maiden, virgin etc. Lojet, I think the female crabs being sold in the asian markets are rock crabs and blue crabs. These may not have any retail restriction re gender. The ones that are restricted are the dungeness crabs. I would agree with MM – I always understood “na donselya na” to mean no longer a virgin. Tagalog has an equivalent term for spring chicken, dumalaga, to differentiate it from an egg-laying hen, inahin. Dumalaga, derives from dalaga, implies youth and chastity. Depending on your community’s mores, those qualities can be good or bad. Remember, primitive societies always sacrificed virgins because they want to keep the party girls around. MM, I have a short story for your statement. The dungeness crab in Canada is abundant but the female is considered untouchable, period. To catch one, you need to secure a license of course ( $15 ?? ), a proper trap and a limit of four keeper size males only, per day per license. To venture out of those restrictions can be very costly they say, which I thought in all the years of living here to be a myth since I’ve never seen someone actually get fined. Until recently…. A few years ago, coming from our annual family camping trip along the coast, we met these group of families in the ferry on the way back to the mainland. They said their camping trip was bummed out because of a hefty fine they received from the Ocean and Fisheries Department for federal law violations. Apparently a random inspection was performed at their campsite and they were caught with dozens of crabs and shellfish over their number limit and worst of all had a lot of females in their catch. Needless to say they are coming home empty handed but with a very expensive ticket. Ouch! I don’t know exactly why and how the amount came about but , at that very instant all I could think off was they could buy more than a hundred crabs in Chinatown for that money . Never saw them again in our camping trips. Your anecdote illustrates that the reason why conservation laws work (in other…err.. places) is because of effective, no-holds-barred enforcement. Walang tong-pats. Sana ganito rin sa atin. you look and sound very informative on television. when the lady vendor referred to the “gay” crabs, i was already thinking a ‘correction’ coming from you … hahaha! and i could see and hear mr. tayag being interviewed but couldn’t remember a thing he shared. another hahaha! I think the Tagalog for virgin is “basal”. Yes, Erleen. That’s one Tagalog “b” word I should remember. Another is balasak for average. Not in any way connected (well a bit, he specializes in seafood ha ha), Chuck Hughes will be at the open park area of Greenbelt on 26 Feb. Hope to see you guys there! goodness! it’s quite insensitive to talk about females that way, and to think this entry was all about crabs. virgins? virtuosity? what the heck?! that there are dalagas who aren’t virtuous?! really?! seriously?! In the San francisco bay area, about 20yrs ago, if you are caught crabbing with dungeoness, you get automatically fined period, even if you have a license, as the recreational license is just for rock crabs. Only fishermen with commercial license are allowed to catch dungeoness varieties. And even for rock crabs, they have a 6 inch minimum required measurement from end to end of the crab shell. I’m not sure what the law is now, but I’m thinking it has to be more stringent now. Donselya i think is coloquial term for virgin. Never realized they have bakla for crabs. I also heard that the chesapeake blue crabs they sell in Maryland are no longer locally sourced, and really coming from SouthEast Asia? 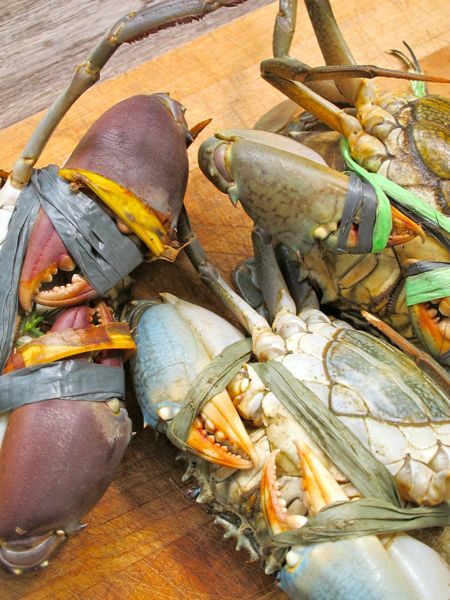 and that might be the reason you can still buy female blue crabs online? Wow! those are really expensive crabs! Whenever we want crabs and I’m quite sure that my mom’s BP is a bit stable, I usually go to Guagua (Pampanga) to buy them. Prices range from 350 and up / kg and usually that’s without haggling (I’m not really good at it). I think their prices are low because Guagua and the town next to it, Sasmuan have a lot of fishponds (sorry I don’t know how you call the place where you grow crabs and shrimps). I usually buy my suahe from there too at an average of 250- 350/kg. hi mm, sa bulacan, bayugin po yung tamang tawag sa “baklang” alimango (na di naman nga talaga bakla). Hi! 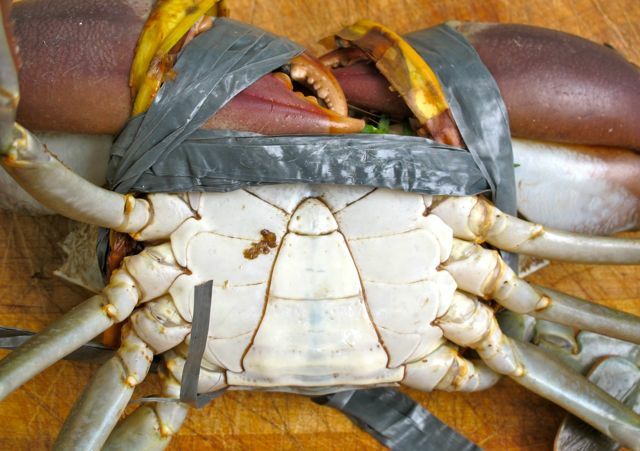 I Can anyone tell me how to check daily market rates of Live Mud Crab in China online or any other source ? how to be updated daily?? Please help me in this regard i want to export it. “dalaga” is the Filipino term for a virgin. I would often hear the elders refer to a woman who, though still young or single, is no longer a virgin as “hindi na dalaga”. Overtime, the word “dalaga” has been loosely used to refer to a young woman or a lass.